I'm not really sure what the sign says, but I'm sure this dude wants me to check the ballot in favor of Ron Paul for President. At first I thought Ron Paul supporters were kinda cute in a grass roots sort of way. Now they are plain freaky and annoying as hell as they spam my email. The Wendy's intersection is historically a place for folks to preach or politic. Dipper Garrison frequently holds signs telling us 'God hearts us' as we sip our coffee and merrily pass him on Hwy 105. And sheesh, he did get a sewer for his efforts. So maybe standing on the corners of the Wendy's intersection isn't such a bad idea afterall. Ya never know, maybe next we'll see Aycock or Wilcox taking advantage of this free advertising hotspot? But I believe in the freedom to have a soapbox and am delighted that free speech reigns at both the Wendy's Intersection and on the Internet. Heh. Here's a little humor to brighten your Sunday afternoon. This political sign is posted right outside the Boone city limits on Hwy 321. 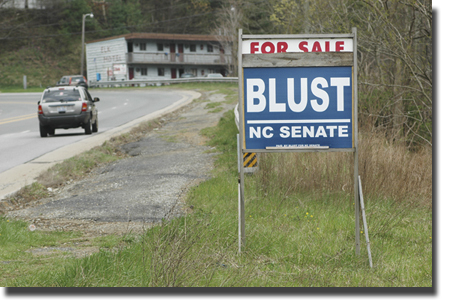 Somebody forgot to mention to the signage volunteers that the possibility of connecting your politician buddy with the idea that he might be 'for sale' is generally considered a really bad idea...a funny one, yes...but not the smartest political signage.